Swapna vaazvai neeki , un por padham thanil cherppai. Daily I praise your flower like golden feet. Remove this dream called life and merge me with your golden feet. Oh son of Uma who is Sakthi, I surrender to you. Who shower on us eight types of wealth. Who graces on those who worship him and eat complete Modhak. 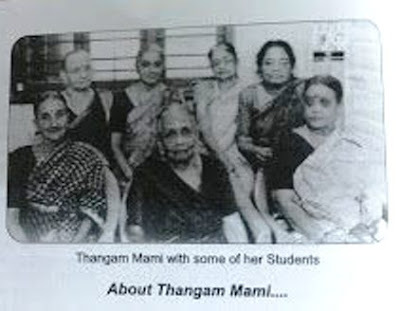 Thanga malar padham saranam saranam. Who has a very pretty temple in Titvala. I Surrender , I surrender to your golden feet. Vidaa muyarchi cheithu vendi varam arulum. And who grants joy to all those devotees who serve him. Pala vagai modhakam Pangudan tharuven. Oh lover of the good , Oh lover of grace. The feet of divine joy, I surrender to the feet of Guru. The feet that was searched by the saints and which removed three types of characters. And light the lamp of divine wisdom. The Vani, the expert in arts , She has voice of the parrot, she who sings in pre tamil. I surrender, I surrender to your golden feet. Srunga giri vasi Saradhe . Oh Goddess who sits on a swan. Un thanga malar padham charanam. I surrender to your golden feet. She who lives in town of Sringeri and one who has a very pretty form. AAni ponnal izhaitha thanga padham saranam. Muthu rathina mizhaitha chirpakaal mandapamum. You shower blessing in heaps and heaps. Saubhagya Lakshmi un than padham saranam amma. With Rambha, Thilothama and Urvasi dancing. Cheer padha chilabin kin kinikal kulunga . And seeing the rope braided kolatta stick play , she sat.. Which is fully made of emerald gems. She with a pretty looks sat. The Dharma Samvardhin , who sitting on. Her lion steed and quenched the thirst. Sri Chamundigai sat in several different ways . Pancha rathna keerthana priye , thanga padham saranam saranam. OH goddess who likes five gem like songs , I surrender surrender to your golden feet. Nara hari sahdhari , para shiva manohari. I surrender , surrenderto your golden feet. Pancharathna keerthanai padinorkkum kettorkkum . Oh Lord of Shiva Sundri. The temple of Shiva of Arunachala mountain. The temple of Shiva who is consort of Unnamulai. And makes our birth fruitful. It is wonderful happy nectar like juice. Along with Parayana of Narayaneeyam and chanting of Sahasra namam. Thanga paadha malar saranam saranam. And We surrender , surrender to his golden feet. Omana unni kannan thanga paadham saranam. I surrender to the golden feet of that darling child. Oh gem like please show your form to us. Parama guruvakave vandha bala Gopalakrishna. Oh boy Gopalakrishna who came as divine teacher . Seeing and Seeing , I was drowned in happiness. Thanga pada malar saranam saranam. To your golden flower like feet. Oh God with a j form of Joy who cam inhis divine form. You please come running , My darling child Krishna. Kaalil chilangai kala kala vendrolikkum. Bala Gopala kannaa padham panithene. Oh boy Gopala, Oh Krishna , I salute your feet. Makimai niraintha malai , manikandan vaazhum malai. Kalayai amaintha malai , por chilayai amarntha malai. Pathinettu padiyerum malai , dharma sastha vaazhum malai. The mountain where you climb 18 steps , the mountain where Dharma Sastha lives. Who one after another seeking your mountain. Bhaktha jana priyane saranam pon ayyappa. Guruvaram thanil Sri Sayinathan Padham paninthiduvom. On Thursdays we would bow before the feet of sage Sai. Let us bow before the feet of sage SAi. WE would surrender to the feet of Saint Sai. Slowly and slowly our entire tounge would be sweet. Athma jnana rishi Valmiki Bhajitha(Bujitha) namam. The sage Valmiki who knew about Athma chanted(ate) that name.